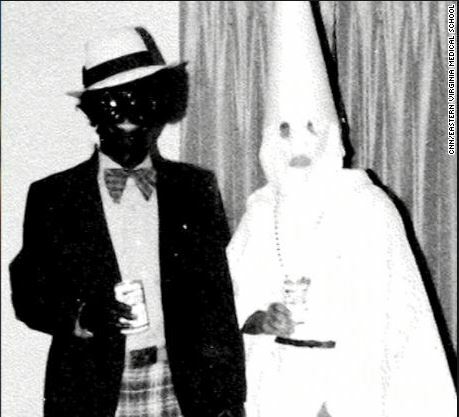 As every sentient adult in the universe must know by now, a yearbook photograph has surfaced in which a man in blackface and a man in Klan robes stand next to each other — and one of the men (which one has not been clarified) is now Virginia governor Ralph Northam. I have to admit to mixed feelings about the Kavanaugh confirmation mess; I don’t know whether I believe the allegations and, if true, I don’t know if he ought to pay all his life for bad behavior as a teenager — especially when there’s no shortage of women who say he has never been anything but a gentleman. What I want to know is this: How has he behaved since entering the adult, workaday world? Longtime blog-buddy Michael Hamar seems to know Northam well. I have known Northam since 2007 when he ran for the Virginia Senate. We first met at a fundraiser at the home a mutual friend. In that successful campaign, Northam defeated Nick Rerras who I had known since my days on the City Committee for the Republican Party of the City of Virginia Beach. In that election, Northam’s opponent, Rerras was a religious extremist and, in my view, like most “Christian conservatives” in Virginia, basically a racist. Northam’s lack of prejudice and religious extremism is what helped him secure victory. We were able to see Ralph interact with the campaign volunteers, many of whom were black. Ralph was gracious, kind and displayed zero prejudice. Indeed, I have never seen him treat anyone as less than his equal or take himself too seriously. When not in campaign mode, we have spent time with the Northams, spent the night in their home and talked and laughed over drinks and dinner and seen them as their true selves. Never, ever, did we see even a hint of racial prejudice. That’s good enough for me. Northam should stay put.